Full disclosure: I have never had an actual muffuletta before, only vegetarian versions. So I can’t say, “Hey guys, this tastes just like a real muffuletta!” I really have no idea if it does. But it does taste just like a vegetarian muffuletta. 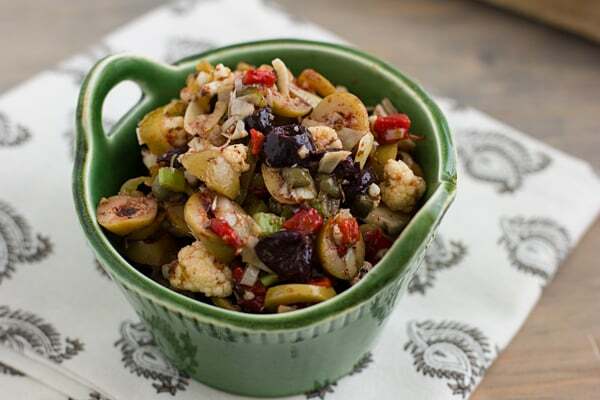 Although muffulettas are named after the bread they’re made on, to me, it’s the olive salad that makes the muffuletta. So this is my version. As my husband helped me chop things for this (oh, and there’s a lot of chopping! ), he wondered how something made with so many nasty jarred ingredients could taste so good. Well, it just does! (And for the record, I love olives and marinated artichoke hearts and capers–Chris thinks they’re gross, though.) The longer you let the salad sit in the fridge, the better it tastes, so don’t hesitate to make this a day or two in advance. Finding authentic muffuletta bread in Raleigh was a little bit difficult. The first time I made this, I used a round loaf of bread, but muffuletta bread is fairly flat and this bread was tall and fluffy so it just didn’t work. So then I switched to ciabatta. It doesn’t have the nice round shape of real muffuletta bread, but it’s flat and not too bready. Although anyone from New Orleans is probably giving me the side-eye right now, you could also put this on sourdough bread, Kaiser rolls, whatever. If you use slices of bread or rolls, instead of making one big sandwich, just make four individual sandwiches with a mushroom on each. 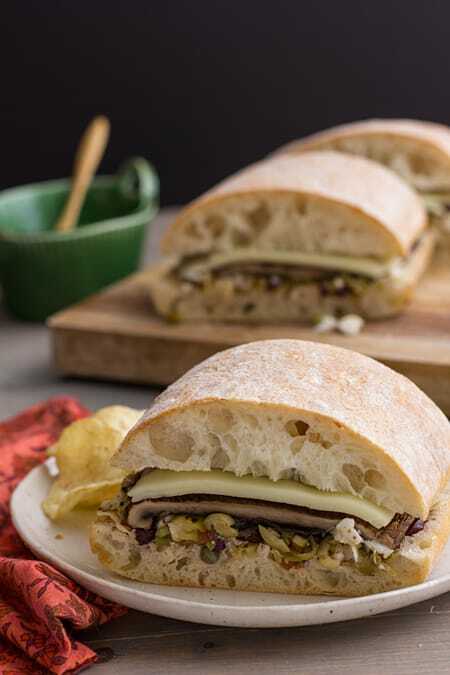 A vegetarian version of the classic muffuletta sandwich, made with grilled portabella mushrooms. Combine all ingredients in small bowl. Cover and refrigerate for at least 8 hours (24 hours is best). Preheat grill to high. Spray with olive oil and place mushrooms on grill. Season with salt and pepper. Cook mushrooms 5-10 minutes, or until softened. Transfer to plate and cool. To assemble sandwiches, spread olive salad onto bottom of ciabatta bread. Top with mushrooms and cheese. Press the other half of the ciabatta loaf onto the top and use a sharp knife to cut into 4 equal segments. Serve immediately or wrap and refrigerate upside down for up to a day. Prep time doesn’t include time that salad marinates in the refrigerator. I’ve never had anything like this, but it sounds fantastic. Not a big fan of portabella! But this looks good. Must give it a try. I had to look up what a muffuletta sandwich is because I don’t think I’ve ever had one before either, but this version looks like the only one I’d ever want! Nat – you must have forgotten that our Dad used to make a huge muffuletta sandwich for dinner every once in a while. I dont’ remember exactly what went on it, but I do remember that the combination of flavours and ingredients was a bit too strong and sophisticated for my taste buds! Now that my tastes have grown up a bit, I think I would love your vegetarian version (and I would probably prefer it on ciabatta bread too)! Yes, I can definitely see how a muffuletta isn’t exactly kid-friendly! 🙂 But I bet you’ll like them now! this looks so good.. love portabello mushrooms.. just LOVE them! i have never had this bread but the idea of portabella mushroom and other chopped ingredients just sounds too delicious! Yum! This sounds so doable. Just out of curiosity, do you recommend Sandwhich? I’m at Carolina, and I usually try to drag my boyfriend to Med Deli, but he isn’t a fan. This might be a great alternative! Oh I’ve had quite a few muffulettas and this looks like the real thing, but of course it’s missing the meat. However, I love the substitution with the grilled portabella. I love grilled portabella burgers so I know I would love this one! Great sandwich! If you like muffulettas and you like portabella burgers, you will definitely love this sandwich! Girl… this… this needs to be my lunch like right now. And it’s not even lunch time. Oh I haven’t had a muffuletta since I moved from New Orleans– and that’s almost 10 years ago! This version sounds amazing. It also looks *perfect* for the picnics we are having this weekend, which be at the Jazz Fest in Five Points neighborhood in Denver. Jazz + muffulettas?! Yup, that will work! Wow this looks like such a great sandwich packed with wonderful flavors! Can I be honest here? I had never heard of muffuletta sandwich before… But gosh, your sandwich sounds delicious! The idea of storing it upside down in the fridge so it doesn’t get soggy is great, thanks for this tip! Had this for dinner tonight. Yum. I am really glad I found your blog; I have made three of your recipes in the past few weeks and all three were very delicious. I am new at being a vegetarian and I am really grateful for all the great recipes you post. Thank you for your comment! 🙂 I’m so glad you enjoyed it! Now THIS looks incredible! I love all that marinated jarred stuff as well (although I find artichokes just a little over-powering). Grilled portobella mushrooms are the best aren’t they? LOVE THEM.